On May 17, Europe’s largest living wild land mammal, the European bison, will be brought back to the Țarcu Mountains in the Southern Carpathians rewilding area, in Romania. It has been extinct from the area for 200 years. About 20 European bison will be brought here from several European countries. Later on this summer 10 more will be taken here. This is the biggest-ever bison reintroduction and transportation to have taken place in Europe. Bison (Bos Bonasus), Kennemerduinen National Park, Kraansvlak, The Netherlands. Enclousure in a fenced reserve, 250 hectar, in Kennemerduinen National Park. Rewilding Europe and its partner WWF-Romania have initiated this first bison reintroduction into the Southern Carpathians with a totally new approach: over the coming ten years Rewilding Europe will regularly release a considerable number of bison, at several pilot sites in Southern Carpathians, each year. Once released into the wild, these bison will not be additionally fed, so that they will become a full part of their natural ecosystem and the natural processes in the area. Initially, the bison will be released into an acclimatisation zone (±15 ha). Then they will be let into an adjoining re-wilding zone (±160 ha). Where the animals will be given the opportunity to ‘re-wild’ and to learn necessary survival skills for life in nature, and also form a solid social herd structure. In early September they will be released into the wild and become the first free roaming bison since the 18th century. And the first such big group to be released. The location where the animals will be released is part of the vast and wild Tarcu Mountains Natura 2000 site, which is some 59,000 hectares in total. Once released to the protected zone, the area will be managed by natural grazing by the bison and other herbivores. For this reason Rewilding Europe is working to increase the numbers also of the other wildlife, in particular red deer and roe deer. There are bears and wolves in the area, which in the future could potentially prey on the bison and thereby, further restore the ecosystems. From the very beginning, although at a start in acclimatisation and re-wilding zones, the bison will also serve as an important regional tourism attraction, to help bring business opportunities and jobs to the local community. A Bison Visitor Centre will be established, from which several bison and nature related activities will be organised. Rewilding Europe and WWF-Romania have been working very closely with the community here, the entrepreneurs, forestry services, hunting organisations and tourism organisations at a local, regional and national level. The Council of the Armenis Municipality, where the bison site is located, has voted unanimously for the European bison reintroduction in their area. The local authorities and the Mayor of Armenis are very committed to the bison release. Locally hired people have been already trained to take the role of bison rangers and the first bison guides. The whole village of Armenis is preparing for the arrival of the bison. The village priest will bless the animals, two Armenis children will open the door of the bison truck, and the village will then celebrate the release at a bison party in the evening of May 17. Rewilding Europe works to try to establish in total at least three new populations of at least 100 individuals each, in other suitable rewilding areas across the continent. In 2015, the initiative plans to start up a second release site in the region, near the village of Poieni close to the town of Hateg. Increasing the numbers of bison is important, not only for the survival of the species, but also for biodiversity reasons. The ecosystems here need the grazing and browsing impact from the bison. Last but not least, large enough numbers of bison and increased numbers of other wildlife are needed for the wildlife-watching part of the nature-based economy to develop, so that a large part of the local community can benefit from it. The European bison is an important part of Romania’s natural heritage and national identity, through legends, myths, stories and place names. The bison’s last strongholds in Romania were in the Carpathians. Romania is the ninth European country with a bison population living in the wild. Free-living bison can also be found in Latvia, Lithuania, Belarus, Ukraine, Poland, Slovakia, Russia, Germany and in Vanatori Neamt in Northern Romania. The global population of European bison is estimated at 5,046 (January 2014), but only some 3,230 of them live in free or semi-free herds. The European bison is actually more rare in the wild than the black rhino in Africa! The Dutch Postcode Lottery, The Swedish Postcode Lottery and the Liberty Wildlife Fund are the donors behind making this amazing bison reintroduction in the Southern Carpathians possible. The bison that are being brought to here come from several European countries: Sweden (Avesta and Kolmården), Germany (Springe, Hardehausen, Hirschfeld), Italy (Parco Natura Viva), Belgium (Han-sur-Lesse), Switzerland (Bern) and Romania (Hateg). The Hirschfeld Zoo, Springe, Bern, Parco Natura Viva and Kolmården have all donated their animals and paid for all export costs. 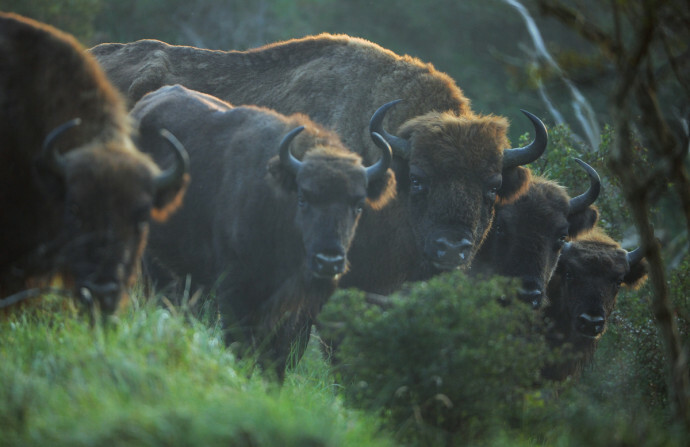 The Wildlife Park Han-sur-Lesse not only did that, but they also hosted several of the Rewilding Europe bison for over a year and covered all the costs for it. The European bison, also called the Wisent, is a so-called keystone species in the European ecosystems, with a very important role for biodiversity and for the balance between forest and grassland habitats in the Carpathians. Besides being a flagship animal for wilderness comeback and wilderness protection, it has the opportunity to also become an iconic species for regional economic development; a possible new symbol for the region. Something that will help to put the area on the map as one of the most important and attractive European wilderness areas and a true wildlife watching destination. Armenis can become the first “Bison village” in Europe.